Looking for a luxurious mountain vacation with modern conveniences? We are proud to offer many Gatlinburg cabins with Wifi Internet so that you can stay connected on your trip! Our Smoky Mountain cabin rentals with WiFi ensure that your stay in the Smokies is comfortable and convenient. These cabins with wireless internet access help keep you up to date with local area events, weather, and attraction information. This is a huge advantage and can ensure that you can enjoy your stay as much as possible. Besides helping to plan and coordinate your family's stay in the Smokies, WiFi Internet access is simply practical and entertaining. Though you may have come to the Smokies to relax and spend time with loved ones, an urgent emergency at work might require your attention for a moment. This convenience allows you to keep up on top of your work load, or at least manage with the flood of emails that seem to pile up whenever you go on vacation. When traveling with family and friends, Internet access is great for evening entertainment! Whether the kids are enjoying watching funny videos or jamming out to music, Internet access can surely make for a fun evening! Even better, our Smoky Mountain cabins with WiFi internet will allow you to post your latest adventures to social media or YouTube so you can keep friends and family members up to date! Be sure to book a Smoky Mountain or Gatlinburg, TN cabin rental with this practical and fun amenity for your cabin vacation in the Smokies. Oftentimes, our cabins with WiFi may come with other excellent amenities. Many of our dog friendly cabins in Gatlinburg or our 3 bedroom cabin rentals also come with WiFi for your convenience. When you book online, you can receive an immediate 15% discount on your stay! Our online cabin discount makes our affordable cabin rentals in Gatlinburg an especially good deal for any budget-conscious vacationer in the Smokies! Find comfortable cabins in Pigeon Forge for rent, such as “Alone At Last,” for your Smoky Mountain vacation. This one-bedroom Pigeon Forge cabin rental offers guests a 3D television, hot tub, and more! Romantic honeymoon cabin in the Smoky Mountains with a heart-shaped jacuzzi across from the fireplace, hot tub and more! Online Cabin Special. Enjoy your romantic cabin near Dollywood, called Whispering Pond, with swimming pool access, hot tub, fireplace, WiFi Internet and much more! Stay at a 1 bedroom cabin rental with a fireplace, hot tub on deck, jacuzzi, porch swing, and queen suite for your Gatlinburg vacation! Looking for a Dollywood area cabin rental? “A New Beginning” gives guests a 1-bedroom cabin with views, WiF,i and sleeping space for 4 guests! Book today & save! Adlers Ridge is a one bedroom cabin located between Pigeon Forge and Gatlinburg in Sky Harbor Resort with Internet, fireplace, hot tub and more. Online Savings! Enjoy a relaxing mountain stay in this 1-bedroom cabin with loft, WiFi internet, hot tub, pool table, and more! Looking for a cabin in Wears Valley with a theater room and a hot tub? Check out "Bear'ly Makin' It," a lovely 1 bedroom cabin that sleeps up to 6 guests! Pet friendly Dollywood cabin rental in Hidden Springs Resort with a year-round swimming pool, king bed with jacuzzi, hot tub and more near Gatlinburg. Dreamweaver, a very romantic honeymoon cabin in Gatlinburg, TN. Located in Sky Harbor Resort with a heart-shaped Jacuzzi tub. Enjoy this 1-bedroom cabin near Gatlinburg in Cabins At The Crossing Resort with swimming pool access, hot tub, fireplace and more! Gatlinburg Lovers Lane at Mountain Shadows Resort, a charming honeymoon cabin rental with pool in Gatlinburg. Book your honeymoon cabin online and SAVE! Enjoy a Smoky Mountain cabin in the woods for a romantic honeymoon or couple's retreat in the mountains. This cabin near Pigeon Forge comes with a discount on your lodging! Experience a 1 bedroom cabin with a mountain view that's close to the best attractions in the Smokies! Book "Peek A View" online and save 15% with our special! Enjoy a romantic getaway for two at this Smoky Mountain Honeymoon rental, "Starry Night," that comes complete with hot tub, a cozy master suite, and more! Book this beautiful honeymoon cabin in Sky Harbor Resort in Gatlinburg that was previously known as "Country Livin" & save 15% on your nightly rate! "The Overlook" is a lovely, 1-bedroom cabin rental in the Smoky Mountains near Dollywood Theme Park that offers mountain views, a hot tub, and a 15% discount! Paradise Ridge cabin near Dollywood with easy access to Gatlinburg. A Long Kiss Tonight is a romantic honeymoon cabin near Gatlinburg with discount savings! Searching for Great Smoky Mountains cabins in Tennessee for your private honeymoon cabin rental, check out A Peaceful Getaway. Smoky Mountains cabins for rent. Enjoy "A Romantic Retreat" or select from our many other 1 bedroom cabins throughout the Tennessee Smokies. Discover this cabin rental near Smoky Mountain National Park and start your affordable Smokies vacation. Makes a great 1 bedroom honeymoon cabin. Searching for Ecohta Resort Rentals near Pigeon Forge TN? "Aah Rocky Top" offers guests a Smoky Mountain cabin rental with a cozy interior that perfect for a couple's or small group getaway. Relax at your cozy 2-bedroom cabin rental near Gatlinburg at "All by Grace," and enjoy a fireplace, hot tub, WiFi, and more! "Angels Attic" is a budget-friendly 1 bedroom cabin with a hot tub and fireplace that's close to Dollywood & Pigeon Forge in the Smoky Mountains of Tennessee! Looking for a cabin near Gatlinburg with a view and fireplace? Look no further than "Bear Hugs II", which offers guests a premium mountain view, hot tub, fireplace, and more! Cloud Nine, a one bedroom cabin close to Dollywood with easy access to attractions, shows and restaurants in both Gatlinburg and Pigeon Forge. Online Savings! Spend enchanted moments in our Smoky Mountains honeymoon cabin near Gatlinburg and Dollywood. Book online for your Cabin Special! Select an adorable honeymoon cabin rental Gatlinburg with heart-shaped jacuzzi facing a stone fireplace. Located between Gatlinburg and Pigeon Forge. "Jasmine's Retreat " is an affordable 1 bedroom cabin that sleeps 6 in the Smoky Mountains that boasts a hot tub, pool table, and a deck with a forested view! A private cabin in the Smokies by Gatlinburg and Pigeon Forge. Book your private cabin rentals online and get immediate SAVINGS! Looking for a special cabin to experience with your sweetheart? Check out "Merry Weather," a charming 1 bedroom cabin located just outside of Pigeon Forge, TN! Check out our cheap cabins near Gatlinburg Tennessee with hot tubs just minutes from area attractions, outlet malls and more. Even cheaper with Online Discount! Looking for cheap cabins near Dollywood, take a look at Where The Magic Happens just minutes from Gatlinburg and next to Dollywood and Pigeon Forge! Enjoy a stay at "Wonderland," an affordable 1- bedroom cabin near Tanger Outlet Mall in a wooded Tennessee Smoky Mountains setting. Theater cabin near Gatlinburg with 10 foot theater screen and theater seating. Located between Gatlinburg and Pigeon Forge in Sky Harbor Resort. A private 2 bedroom cabin rental in Sevierville, TN with wireless internet access, hot tub, game room and more for your vacation getaway in Pigeon Forge. Book your 2 bedroom cabin rental with theater room, game room, hot tub, Internet access, Jacuzzi and more for your next Great Smoky Mountains vacation getaway! "A Bear's View" is an excellent Smoky Mountain cabin with a hot tub, a forested view, and a game room complete with a foosball table and pool table near Gatlinburg! Wears Valley 2 bedroom cabin rental with pool table, hot tub, Internet access, Jacuzzi and more awaiting your escape to the spectacular Smoky Mountains! Book your very own cabin in the Smoky Mountains with great views close to Pigeon Forge. "Altitude Adjustment" is a 2 bedroom cabin rental that sleeps 4 guests. Big Sky View, a beautiful 2 bedroom vacation rental near Gatlinburg in Sky Harbor Resort with a fireplace, game room and more. Enjoy views from the sunken hot tub! Book a premium cabin for your family only minutes away from Gatlinburg, TN! This rental comes with a theater room, hot tub, arcade games, and mountain settings! Book "Creekside Hideaway" today to save 15% on this two bedroom honeymoon cabin with a hot tub, resort pool, and beautiful spot on a Smoky Mountain stream. Find yourself in the Smoky Mountains of Tennessee at "Eagle's Crest!" This luxury theater room cabin in the Smokies boasts terrific views and a great location. Stay in the Smoky Mountains in style when you book your premium 2-bedroom cabin with a home theater system, game room, hot tub, jacuzzi, and awesome views. Lucky Break is a Starr Crest Resort cabin rental near Dollywood in Pigeon Forge, Tennessee. Enjoy resort swimming pool access, WiFi, pool table and more. Experience a Smoky Mountain cabin with a truly stunning view that's nestled in the mountains above Dollywood Theme Park. Book online and save! Check out this luxurious 2 bedroom cabin near Dollywood that comes with a game room, private pool, a theater room, and more in the Great Smoky Mountains! "Scenic Mountain Pool" is a luxury cabin near Dollywood in the Smoky Mountains that boasts a private pool and an unforgettable mountain view! Come enjoy this 2-bedroom cabin rental near Dollywood with swimming pool access on your Tennessee Smoky Mountains vacation! Online Cabin Special! Your Smoky Mountain cabin rental, “Southern Style”, is an elegant 2 bedroom Sevierville cabin rental located in The Oaks Resort. Come experience "Swimming Hole," a luxurious 2 bedroom cabin with mountain views, a private pool, and a game room with an air hockey table in the Smokies! Book a cabin close to Gatlinburg and Dollywood with an indoor swimming pool, game room, hot tub, mountain views, and more! Reserve your cabin & save 15%! Save 15% on your nightly rate and enjoy a log cabin with a great location in Sevierville only minutes away from Pigeon Forge and Dollywood! A 2 bedroom cabin rental in Sevierville, near Pigeon Forge in Sky Harbor Resort. Wifi Internet, pool table, hot tub and more. Book "A Little Bit of Heaven" for an incredible resort cabin vacation in the Smoky Mountains. This rental offers comfortable amenities and awesome views! A Peaceful Retreat cabin rental near Gatlinburg. A charming 2 bedroom Smoky Mountain cabin in Sky Harbor Resort with easy access to Gatlinburg and Pigeon Forge. Enjoyable Smoky Mountain cabin rental in Smoky Mountain Ridge Resort Wears Valley. Swimming pool access, WiFi Internet and more with Online Cabin Special! Alpine Retreat, a cabin rental in Wears Valley, TN with 2 bedrooms sleeping 6. Book this Wears Valley cabin with a yard online and get immediate savings! Autumn Run is a secluded cabin near Gatlinburg with hot tub, fireplace, pool table and more just minutes from downtown Gatlinburg. Online Booking Special! A five star Smoky Mountain 2 bedroom cabin rental with easy access downtown Pigeon Forge or Gatlinburg. Enjoy dozens of attractions, live shows and more. Private Gatlinburg 2 bedroom cabin rental between Gatlinburg Pigeon Forge in Sky Harbor Resort minutes from either downtown Gatlinburg or Pigeon Forge. Stay at a cabin in the Smoky Mountains with a hot tub, pool table, and a great view! Enjoy staying near all the action and save big with a 15% lodging discount! Area Gatlinburg cabin rental with internet access. Bear-rif-ic is a wonderful 2BR cabin located between Gatlinburg and Pigeon Forge. Online Savings Special! Book "Bearway To Heaven," a lovely 2 bedroom cabin with Smoky Mountain views and an arcade game. This family cabin near Pigeon Forge comes with a discount! Enjoy your Smoky Mountain semi-secluded cabin rental, Blessed Memories, near Downtown Pigeon Forge and Dollywood with sauna, hot tub, WiFi and more. Located in the beautiful Lone Branch Creek Resort area, you'll find "Cherokee Creekside" a 2 bedroom cabin with creek access that's close to Dollywood! Stay at a cabin between Gatlinburg and Pigeon Forge. Endless Joy is a cabin in the Smoky Mountains with easy access to attractions in both cities. Enjoy a vacation in the mountains at this lovely Gatlinburg cabin in Sky Harbor. You’ll enjoy great views, internet access, and more! "Just Barely Making It" gives vacationers to the Smokies a chance to enjoy a comfortable cabin near Gatlinburg with wireless internet, hot tub, fireplace, and more! "Lil Country Cabin" is located in Cabins At The Crossing in Sevierville, TN. Book this cozy resort 2 bedroom cabin sleeping 6 with swimming pool access and hot tub. Escape to a quiet mountain retreat at “Moonshadow,” a secluded cabin near Gatlinburg, that offers guests comfortable cabin amenities and convenience to top attractions in Pigeon Forge. Book a Wears Valley cabin with 2 bedrooms and room for up to 4 guests from Cabins USA Gatlinburg to save 15% on your nightly rate on your Smokies vacation! Looking for luxury chalet rentals in Gatlinburg TN? Queen Margaret is the finest Smoky Mountain luxury chalet I’ve seen in the entire Smoky Mountains! With 2 bedrooms and room for up to 6 guests, "Radiant Ridge" is perfect for your family vacation and comes complete with a hot tub, pool access, and a 15% discount! Reserve your own Gatlinburg cabin with a view of Mt. LeConte! "Reclusive Moose" is an affordable cabin rental with 2-bedrooms and a special 15% discount! Escape to the mountains at "A Bear's End"! This non-smoking cabin near Gatlinburg offers guests comfortable cabin amenities and a convenient location! Smoky Mountain 2 bedroom cabin rental with mountain views named "A Hilltop Heaven" with WiFi Internet, hot tub, game room and more! Book online and save! Book your own 2 bedroom log cabin near Dollywood and Pigeon Forge for a terrific family vacation in the Smokies with a hot tub, fireplace, and pool table! Enjoy comfortable cabin features, such as a jacuzzi tub, hot tub, wood burning fireplace, and more at this cabin that sleeps 7 near Gatlinburg, "A Wolf's Den!" Reserve this cabin with a mountain view in the Smokies with Cabins USA Gatlinburg to earn a 15% discount on your nightly rate! Book your Hidden Mountain Resort cabin near Gatlinburg with a hot tub, fireplace, wireless Internet and more. Earn an Online Cabin Special! "Hide-A-Way Point" is a lovely 2 bedroom cabin rental in the Wears Valley area of the Smokies with a hot tub, jacuzzi, pool table, and a 15% discount! Welcome to "Mountain Breeze," a comfortable 2 bedroom cabin rental in the Cobbly Nob area that comes complete with pool access, foosball, and a 15% discount! Reserve a Gatlinburg cabin with a resort pool, theater room, game room, and mountain views that sleeps up to 8 guests in Smoky Mountain comfort! Enjoy a Smoky Mountain vacation with this 3 bedroom cabin rental in Sevierville, TN with a theater room, great views, and our special log cabin discount! Premium Cabin Pigeon Forge with spectacular Smoky Mountain views, Internet, hot tub and more! Book this premium cabin Online for immediate SAVINGS! Welcome to "Bear Pause Cabin," an excellent 3 bedroom cabin with a hot tub, pool table, and resort pool that's only minutes from Gatlinburg, TN! Reserve your own affordable, 3-bedroom cabin that sleeps 8 guests in the Great Smoky Mountains! Book with Cabins USA Gatlinburg & save 15% on your rental! Book "Blue Sky" to enjoy a Smoky Mountain cabin vacation with pool access, a hot tub, game room, and beautiful mountain views from Cabins USA Gatlinburg! Experience a premium Gatlinburg cabin with an indoor swimming pool located only a few miles from Gatlinburg and Ober Ski Mountain in a resort! Honey Bear is 3BR cabin rental near Gatlinburg in Wears Valley. Sleeps 9 guests with hot tub, 3D television, and scenic mountain views. Online Special! Experience cabin luxury and beautiful mountain views when you stay at "Lasting Impression." Book online today & save 15% with our discount! Searching for a luxury 3 bedroom cabin in the Smokies? "River Breeze" is cabin in the Smokies with a river view, a game room, and our special 15% discount! Get ready for a Great Smoky Mountain vacation when you book "Star Gazer," a 3 bedroom cabin in Grand View Resort with a pool, game room, and mountain views! Starr Crest Resort cabin rental Sugar and Spice is a luxury 3 bedroom cabin with resort swimming pool access and rated a 5 Star View cabin! Looking for a cabin with a beautiful view of Wears Valley? Look no further than "Sugar Bear View," a 3 bedroom cabin with a hot tub, pool table, and more! "View Topia Falls" is an exceptional log cabin with a private, year-round pool in the Smoky Mountain Village Resort area with a gorgeous mountain view! Stay at "A Ruff Life," a Smoky Mountain log cabin in Eagle Crest Resort area only minutes from Dollywood Theme Park with 3 bedrooms and room for 8 guests! "Bear Mountain Lodge" is a beautiful cabin in the Covered Bridge Resort area of Wears Valley only a short drive from Pigeon Forge, TN! Looking for a cabin in Wears Valley for 8 guests? "Bella Casa" offers 3 bedrooms, an air hockey table, and more to make your Smoky Mountain vacation unforgettable. Family cabin vacations start with your Smoky Mountains cabin rental "BlueBaery Hill," a 3-bedroom cabin located between Pigeon Forge and Gatlinburg, Tennessee. Come experience "Cherokee Hilltop," a lovely 3 bedroom cabin in the Smoky Mountains with a ping pong table, pool table, skee ball, a hot tub and more! Escape to the beauty of the majestic Great Smoky Mountains at “Emerald View.” This 3-Bedroom Gatlinburg cabin with a view offers guests a chance to enjoy a comfortable vacation getaway. 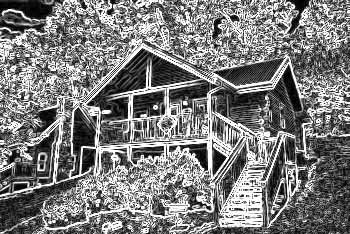 Enjoy the best the Smoky Mountains can offer from this lovely 3-bedroom Sky Harbor cabin with room for 8 guests. Save 15% on your cabin in the mountains! Fort Knoxx in Gatlinburg, TN comes complete with excellent amenities and a beautiful location in the mountains. Book today & earn a discount on your stay! Come experience "Gray Fox Den," a 3 bedroom cabin with a theater room and resort swimming pool access in Black Bear Falls Resort! Located in the Upper Middle Creek Rd area of the Smokies, you'll find "Memory Maker" an excellent 3 bedroom cabin with a game room and a hot tub. Searching for a cabin that's close to Downtown Gatlinburg? Get away to "Moonshine Inn!" to save 15% on this 3-bedroom cabin near a Gatlinburg Trolley stop! Come experience a secluded cabin vacation near Dollywood Theme Park when you book "Smokeys Dream Views," a 3 bedroom cabin from Cabins USA Gatlinburg! Cedar Creek Crossing welcomes you to "Smokies View", your Smoky Mountain cabin home away from home with WiFi, pool table game room, fire pit and more. Book your 3 bedroom cabin rentals in Pigeon Forge with hot tub, Internet access and more for immediate online savings. Need a cabin that sleeps 7 guests close to Dollywood with pool access? Check out "Cheeky Chipmunk Getaway," a 3 bedroom cabin by Cabins USA Gatlinburg! Start planning your affordable Smoky Mountain vacation when you book "Cozy Hideaway" a 3 bedroom cabin that sleeps 8 guests in comfort! Experience a luxury Gatlinburg cabin with a theater room, resort pool, game room, mountain views, and incredible location minutes from Ober and downtown. Vacation near Dollywood in true cabin comfort at "Above The Smokies!" Stay at this 5-bedroom with room for 14 guests and incredible mountain views! Come experience this luxury 5 bedroom cabin in Chalet Village with pool access, a theater room, a game room, hot tub, and room for 12 guests! Enjoy all the Smokies have to offer when you book “Cloud Bound,” a group cabin near Gatlinburg with indoor pool, theater room, game room, and so much more! Looking for a log cabin in the Smokies with an indoor private pool and a theater room? "Dive Inn" is the 5-bedroom luxury cabin you've been looking for! Visit the scenic Smoky Mountains and stay in a Tennessee vacation rental at "Hilltop Hideaway!" This five- bedroom cabin in Tennessee sleeps up to 15 guests and offers a convenient location near area attractions. Take in gorgeous views of the mountains at your group cabin in Gatlinburg with a view, 5 bedrooms, and pool access! Come experience "Makin' Waves," a 5 bedroom cabin rental located in the Black Bear Ridge Resort area of Pigeon Forge, TN! Come stay at one of our cabins with game rooms and hot tubs, "Soaring Ridge Lodge!" This 5-bedroom cabin offers guests comfortable cabin amenities and a convenient location near local attractions. Take the whole family to the Smokies at "A Stunning View", a 5-bedroom cabin with deck, pool access, and plenty more for a group vacation to remember! "Deer To My Heart" is a comfortable 5 bedroom cabin that sleeps 14 in Hidden Springs Resort in Pigeon Forge. Enjoy resort pool access, a hot tub, and our 15% discount! Enjoy “A Smoky Mountain Dream” with this group cabin with indoor pool, game room, theater room, and more in the Smoky Mountains. Come escape to the mountains for a vacation to remember at this group cabin near Gatlinburg with indoor pool, theater room, and more! “Bear Paddle Cabin” offers guests a chance to enjoy excellent amenities in a convenient location. Experience "Copper Ridge Lodge," a large, 6-bedroom luxury cabin in Starr Crest Resort near Dollywood complete with pool access and a swim spa. "Majestic Mountain Splash" is a luxury 6 bedroom cabin in the Smoky Mountains with a mountain view, indoor pool, game room, and theater room! Looking for a luxury cabin lodge with room for 17 guests in the Smoky Mountains? "Majestic Splash" boasts an indoor cabin pool and a 15% discount rate! Welcome to "Splashin' With A View," a lovely Smoky Mountain resort cabin that comes complete with a mountain view, theater room, game room and a private pool! Come experience "Swimmin' In The Smokies," a 6 bedroom luxury cabin with a mountain view and a private indoor swimming pool! Book & save 15% today! Cabin rental with private indoor pool near Gatlinburg, TN! Luxury cabin close to Gatlinburg with resort pool and hot tub Smoky Mountains, Cabins USA Gatlinburg. Book "Grand Pinnacle," a 6 bedroom group Gatlinburg Cabin in Chalet Village Resort with pool access, game room, wood fireplace, and a 15% discount!